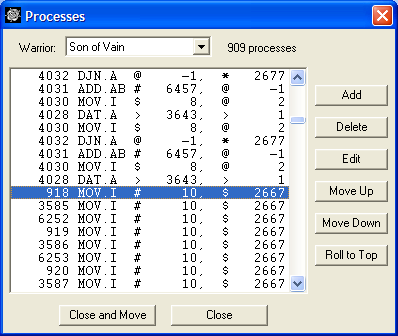 This dialog box shows the core location, and the instruction at that location, of each process of the warrior selected in the drop-down box. The first process in the list is the one that will be executed next. The process queue may be edited by using the buttons to the right of the process list. · Add: Brings up a location dialog box. Type in a location at which to begin a new process, then click OK. The new process is queued immediately after the selected process. · Delete: Removes the selected process from the process queue. · Edit: Brings up a location dialog box. Type in a new location for the selected process, then click OK.
· Move Up: Moves the selected process ahead of the prior process in the process queue. · Move Down: Moves the selected process behind the next process in the process queue. · Roll to Top: Makes the selected process the next one to be executed (at the top of the queue). All other processes are moved by the same amount, so that the relative order of the processes is unchanged. · If the Close and Move button is clicked, the dialog box closes and the Core View window moves to the location of the selected process. · If the Close button is clicked, the dialog box closes and the Core View location does not change.